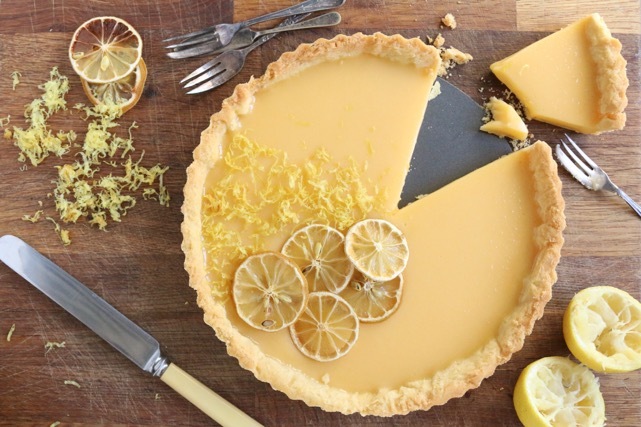 This is a deliciously tangy lemon tart with a hint of juniper that makes it a bit special. This recipe calls for many many egg yolks but don’t throw away your egg whites, use them to make a meringue or use them as an excuse to make your favorite cocktail (if it’s one that requires egg white that is). I always use a food processor with the blade attachment for this pastry. Put the flour and sifted icing sugar into the food processor first. Cut the chilled butter into 1-2cm cubes and add it to the flour. Pulse the mixture until you have golden crumbs. Add the egg yolks and blitz you have a smooth pastry dough. Roll the pastry out between two sheets of baking paper until it is about ½ cm thick then remove the top sheet of baking paper. Turn the rolled pastry sheet upside down to transfer it onto a tart tin with a removable base. You want the side with no baking paper facing down. Press the pastry into the tart tin, remove the baking paper and fill in any tears or holes in the base by gently pressing excess pastry into them (you will have some excess). Trim the edges with a knife. Put the prepared tart tin into the freezer for 20 minutes before you bake it. Cover the chilled pastry with foil and fill the tart with baking beads*. Bake the pastry case for 30-35 minutes until the base of the tart is golden. Let the baking beads cool a little before attempting to remove them. Remove the baking beads and foil from the baked tart case. And allow the case to cool completely before making the filling. Pour the egg yolks and sugar into a mixing bowl and whisk until pale and all the sugar has dissolved. Pour the whisked egg yolks and sugar into a small saucepan. Add the remaining ingredients and cook over a low heat until the butter has melted and all the ingredients have combined. Continue heating the mixture over a low heat until it thickens. The filling is ready when it coats the back of a wooden spoon. Pour the thickened lemon curd into the prepared tart case. Chill for 2-3 hours until the filling has set. Serve with double cream or just enjoy the lemony goodness on its own.